I carry these two little cards in my wallet wherever I go. Mainly because I eat out a lot, but also on the occasion when I buy/eat produce or seafood, I like to know what I am buying/eating. Fortunately, for the most part, I get my produce from Farm Fresh to You, an all-organic cooperative that delivers my produce to my front door. But sometimes, I need an onion to go with that produce, and so, I’m at the store. I try to get everything organic that I have control over, but what if I can’t for some reason? What fruits and veggies have the lowest pesticides? Enter handy card. I picked up the produce card from GROW– a cute little market here in the South Bay. Now you know about your fruits and veggies too. 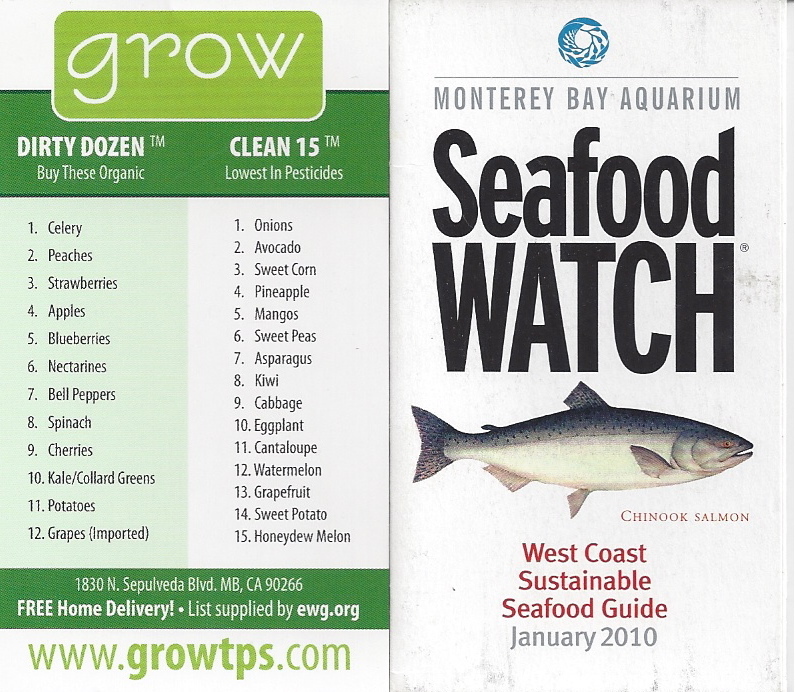 As for the other card, the West Coast Sustainable Seafood Guide, I picked up this little ditty at the Seattle Aquarium, although, it is produced by the Monterey Bay Aquarium. I have used this guide countless times at restaurants, grocery stores and markets. For instance, I am careful in getting US Oregon Shrimp whenever I can vs. Thai shrimp. You can also get the iPhone app version… which is even handier. It even has a section on Sushi! You can check out the the full list of Sustainable seafood on the Seafood Watch website. By the way, the guides do change, depending on where you live. By purchasing/consuming sustainable seafood, you are keeping the oceans abundant and healthy. Who doesn’t want that?